Mixing the tracks you've recorded is every bit as important as the recording itself. It might even be more so - mistakes can be rescued (or buried) in the mix, and it's the area of the session that determines the final sound of the tracks. Going back not too far, everything had to be mixed by hand. That meant, if you were using 24 tracks, then the producer or engineer had to have very busy hands, and plenty of subtleties were probably lost; it simply wasn't physically possible to cover everything for every second. Obviously, the fewer the number of tracks, the greater the amount of control during manual mixing. But it still required absolute familiarity with the pieces being mixed, and the ability to anticipate changes within the song. With almost everything being recorded on hard disk using software, we now live in the era of the "automated mix." That effectively means you can listen to the raw tracks, and set the levels for each track, and it will be remembered. So you build up a mix track by track, not having to worry about what you've done. Of course, once levels have been set, they can be adjusted. It's still a process that involves a lot of fine tuning, but it offers far more control and precision than the old method, and a great deal less stress. What Do You Want From A Mix? The chances are that any particular piece will go through several mixes. The initial rough mix will give you an idea of the track's final shape, with each subsequent one bringing out the subtleties of the piece. You'll listen on the studio monitor speakers, which should be very high quality, better than most people have at home. You'll be able to hear every part - and every error - on them. That's fine for the process of mixing, but you also have to bear in mind the way the music will be heard - through car speakers, radio speakers, at home. That's why it's worthwhile burning copies of each mix and listening to them on different speakers to judge what works and what doesn't. It might be, for instance, that you need to boost the bass more than you thought, or bring out a particular instrument. What you ideally want in the end is a piece that will sound good on any type of speaker. Think of your favourite music and how it sounds, regardless of where you play it. That's your goal, and it can be difficult to achieve. Start from the bottom. In the case of a rock band, that means the drums. That usually involves several separate tracks on the control board, finding a balance between them that still allows any fills to be heard, and the beat to be emphasised. From there bring in the bass. It should mesh with the drums as a rhythm section, but with enough clarity to be easily heard. The two instruments together are the foundation of the piece, strong enough to propel it, but subtle enough not to intrude on the main melodies. Bring in the other rhythm instruments. That might be a guitar or keyboard track. Again, it should be apparent it's there, but never intrusive. Finally come the lead instruments and the voice. By their nature they need to be at the front of the mix, and might need effects here and there (a touch of delay, for example). This will also be the stage when you bring in any overdubs that might have been used, like doubling up the main instrument or voice, adding an extra part in a solo, etc. From there it becomes a matter of degrees and tinkering with the basic mix until you find something that pleases you. It's worth remembering that mixing is a process that can't be hurried. The chances are you'll be thoroughly sick of a piece by the time you've finished mixing it, having heard it so often. 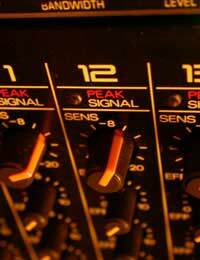 Allow as much time for mixing as you did for recording - and don't be surprised if you need even longer. But it's worth the investment of time and money. Good clear account and very useful. Would be useful to expand to include a few more technical points on particular FX's and alternatives to a rock band. But perhaps that's more than intended.